Originally posted on the Billings Gazette by Tom Lutey. December 22, 2012. And then there are folks like Don Steinbeisser Jr., a farmer, Twitter user, a man in the crowded public square of social media without so much as a galvanized bucket on which to stand. If he’s sitting in a feed truck waiting to get loaded, Steinbeisser pulls his smartphone from his shirt pocket to see what’s being said about the crops he grows and maybe enlighten people about why he does what he does. Steinbeisser farms sugar beets, which in the United States are almost all genetically modified. He tells anyone willing to listen that sugar beets designed to survive spraying the herbicide Roundup aren’t bad. With 80 followers on Twitter, Steinbeisser is no Food Inc. But he is part of a growing movement by farmers to capture some of the media narrative about agriculture. Farmers and cowboys readily acknowledge that their business is smarting from negative stories about animal treatment, food processing and “factory farms,” a smokestacks-and-cogs connotation that makes aggies bristle. Forrest Roberts, National Cattlemen’s Beef Association president, calls the people disseminating those stories “informers,” a relatively small group of about 5,000 people interested in food use as a resource. Roberts told the Montana Stockgrowers Association gathered last Friday in Billings that it’s important that farmers and ranchers enter the social-media stream and join the food conversation. The beef industry needs to win over the next big generation of consumers, known as millennials, Roberts said. The future depends on it. Millennials are the generation born between 1980 and 2000. They are 80 million strong, roughly twice the size of Generation X, which separates millennials from baby boomers — the aging, post-World War II generation that because of its size has driven American shopping decisions for 60 years. Baby boomers number about 70 million. Baby boomers are reliable beef consumers. Millennials are the next big wave of consumers, Roberts said. And millennials are now at an age where the eating habits they establish are likely to determine what they eat for the rest of their lives. “We’ve got about five years to turn the tide,” Roberts said. Price is important to millennials, but so is the way animals are raised and whether the environment has been negatively affected. Personal stories told by actual ranchers raising beef could be the difference. “We have to tell our stories. Yes, consumers are asking more questions about where their food comes from,” said Lauren Chase of the Montana Stockgrowers Association. The Stockgrowers hired Chase two years ago to help its members tell the Montana ranch story to an audience unfamiliar with agriculture. Fewer than two percent of Americans farm today, according the U.S. Department of Agriculture. That’s down from 38 percent in 1900. Because few consumers know anyone involved in agriculture, there is a growing disconnection with the general public, Chase said. This year, the Stockgrowers launched its most aggressive social outreach yet. The group published a coffee table book about Montana ranching, complete with quick response codes for mobile phone scanning. The tags link smartphone users to online videos that compliment the book. “My ultimate goal is to get this book in the hands of a random mom in Chicago that goes to the market to buy her beef and doesn’t know where it comes from,” Chase said. Chase has her rancher board of directors posting on Facebook and Twitter, no small task given that the average rancher is pushing 60. The Montana Stockgrowers Facebook page is updated daily with photos and video. On Twitter, Chase is tweeting the rancher narrative 140 characters at a time. She is a big advocate of Pinterest, a sort of online bulletin board where members post recipes and other items of interest. Pinterest appeals to women, who are still the predominant grocery shoppers in American culture. Since hiring Chase, the Stockgrowers have increased their Facebook followers threefold to 3,442 people. Their next goal is to get those followers to share the page with other friends. The one thing the Stockgrowers don’t do is blog. Chase said it’s hard to hold people’s attention long on the Internet. She prefers photos and video. It was a viral video of an old dairy cow, unable to walk, being dragged through a slaughter plant by a forklift that prompted Mariah Shammel to start blogging her story. The video, which led to the plant’s closure and exposed a major source for school lunch meat, angered the public. It angered Shammel, too. The food in her cupboards are free of high-fructose corn syrup, a sweetener regularly targeted by both groups concerned about childhood obesity and those concerned about genetically modified food. Shammel’s blog, “The Kleenex Chronicles,” gives readers a ranch wife’s perspective on a life that’s both rewarding and arduous. A city girl who married into the farm life, Shammel has bad hay fever and never goes anywhere without a tissue in hand, which is the back story to her blog title. Her posts have been on hold of late as she adapts to motherhood, but she says she will get back into it if she can balance the blog with her ranch work and looking after her son, Colter. Her husband, Lyle, can use her help. She also writes a column for the Montana Farm Bureau Federation. “I still tend to spend the majority of my time talking to an eight-month-old and being on Little Man duty (or doody, more like it) so I can usually be found wrangling him around the house until he naps. And then I run outside to take care of our replacement heifers, feed the baby bulls and horses and check on the new pairs that have been brought up from down below. And sometimes, if I’m lucky, I even get a shower. It’s a big day when that happens! What Shammel wants more than anything is for consumers pulling T-bones from the refrigerated supermarket case to realize that there are real people on the far end of the equation who care deeply about the food that’s raised. In October, the Montana Stockgrowers Association released Big Sky Boots: Working Seasons of a Montana Cowboy, a coffee table photography book featuring the work of Lauren Chase, the organization’s multimedia outreach specialist. Carl Mattson of the MSGA visited Art Taft on “Montana This Morning” to talk about the book and what went into creating it. Chase spent the a year and a half gathering photographs for the book, traveling to ranches across Montana. The book takes the reader on a journey through a year in the life of Montana’s cowboys – through calving, branding, and shipping, and everything in between. Big Sky Boots is part of a larger project that uses social media sites such as Facebook, Twitter, and YouTube to tell the stories of Montana’s ranching families through photo albums, audio slide shows, and videos. Chase says that one hallmark of the book is that the photos are largely untouched or enhanced by photo editing software. Big Sky Boots is the first book in a series of five books that MSGA will develop over the next five years. The next book, already in production, will feature the women that are an essential part of today’s ranching families. Originally posted on Dec. 8, 2012. Proud grandparents can be better at promotion than the best public relations experts. That’s how I learned about Lauren Chase, multimedia outreach specialist for the Montana Stockgrowers Association. Her grandpa, Dave Dohnalek, farmed for decades on his Iowa land. Now retired, he and his wife stop into the Kava Houseregularly. That’s where I served them lunch and learned about Lauren. The recent University of Iowa graduate has worked to bring the association into the social media world. She maintains many platforms (facebook, YouTube, etc.) and put together a large coffee table book, celebrating the ranch life. 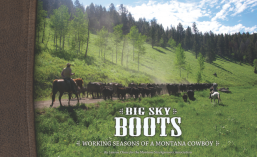 In early October, the Montana Stockgrowers Association will releaseBig Sky Boots: Working Seasons of a Montana Cowboy, a coffee table photography book featuring the work of Lauren Chase, the organization’s multimedia outreach specialist. Chase has spent the past year and a half gathering photographs for the book, traveling to ranches across Montana. Upset by the negative connotations national programs such as “Food Inc.” were making about agriculture and the cattle industry, the Montana Stockgrowers Association set out to tell its story in a new way and with the help of a city girl. “Big Sky Boots: Working Seasons of a Montana Cowboy” has been published and features full-page photographs detailing many of Montana’s ranching families taken by Montana newcomer Lauren Chase. “It’s been a long process, but I’m very excited about it,” said Chase, originally from Cedar Rapids, Iowa. The book is scheduled to be the first in a series of five that will highlight the different aspects of Montana’s many ranches, according to Carl Mattson, program developer with the Montana Stockgrowers Association. While this book focuses on the men of the ranches and the many seasons of ranching — from calving to summer grazing to trailing and more, Mattson said the next book will focus on the women of the ranch, followed by the children and young animals, then the environment, and the fifth book will be determined at a later date. Not only does the book feature Chase’s photography skills honed in journalism school at the University of Iowa, it also has QR codes on some of the pages that can be scanned on a smartphone and will link observers to the Montana Stockgrowers website, where they can watch video and see extended stories on the families profiled, according to Mattson. The book is available for purchase online or in the Montana Stockgrowers Association office for $75. Mattson said they timed the release of the book around the holidays. He sees this being a good gift for someone who has moved away from the ranch and is interested in reminiscing. Mattson said the Montana Stockgrowers Association originally hired Chase as an intern in the summer 2010, but soon realized that in order to tell the Montana ranching family story, they needed to hire her full time. Using a grant from the MSA’s Research, Education and Endowment Foundation, along with sponsorship from a number of banks, the Stockgrowers were able to bring Chase back to Montana in February 2011 to get started on the project. Chase said her first visit to a ranch was just outside of Harrison during calving season. It was 20 degrees below zero and her eyes were watering because of the cold, which caused her eyelashes to freeze, and her camera lens also fogged up. But she took it all in stride. “I thought it was an adventure,” she said. Since her arrival she’s traveled 35,000 miles and visited ranches from Sidney to Chinook. She brought along with her not only a camera, but her phone to make videos, as well as a separate video camera so that the stories could also be captured for the Stockgrowers’ website as well. “Sometimes I even had an audio recorder duct-taped around my arm,” Chase said. She watched as the ranchers were perpetually busy checking on newborn calves or feeding the cattle. Most of the ranchers and ranches that appear in the book are members of the Montana Stockgrowers, but sometimes Chase said she would have to make a cold call to a ranch. She found most were willing, and if they weren’t, they took her over to their neighbor’s place to get photos. Chase said she averaged 300 to 800 photos per ranch. “My goal is to educate as many people as possible about ranching and how beef is produced,” Chase said. Big Sky Boots: Working Seasons of a Montana Cowboy is sponsored by the Bank of Baker, First Interstate Bank, US Bank, Bair Ranch Foundation, MSGA REEF, Stockman Bank, Montana Livestock Ag Credit, Inc., and Northwest Farm Credit Services. Big Sky Boots is a project from the Montana Stockgrowers Association and was produced by Lauren Chase. Feel free to email her with ideas, questions, or concerns: lauren@mtbeef.org.